At today’s sitting of the Riigikogu, the Auditor General Alar Karis gave an overview of the use and preservation of state assets in 2015–2016. “The Governments come and go, but the problems of our energy sector, education, healthcare and pension system, and the issues of the labour market and the development of economy need solution. The state reform and the administrative reform are pending. The reality forces fundamental changes on us – very many functions of the state and duties before the people need to be thoroughly reviewed,” Auditor General Alar Karis said. “Estonia is going to meet the year 2017 in the situation where our national debt is the smallest in the whole European Union. Employment is close to the maximum of the time after the restoration of Estonia’s independence. The source of wealth, labour force productivity, is however reluctant to improve and is at the level where it was five years ago, as compared with the rest of Europe. Last year, the economic growth of Estonia was down by nearly a half, as compared to the European Union average, and the purchasing power has also decreased. However, the pressure on the functioning and the maintenance costs of the state is increasing,” Karis pointed out. “The state budget will keep growing, but the proportion of planned expenditure will increase from this year’s 78% to approximately 80% by 2020. Already in a few years, the social and health care sector will account for half of the state budget expenditure, and this will leave few possibilities to support the development of other areas of activity of the state. A large share of state investments continue to be made with the help of European Union assistance,” the Auditor General said. Auditor General Alar Karis said that the state assets total about 30 billion euro. 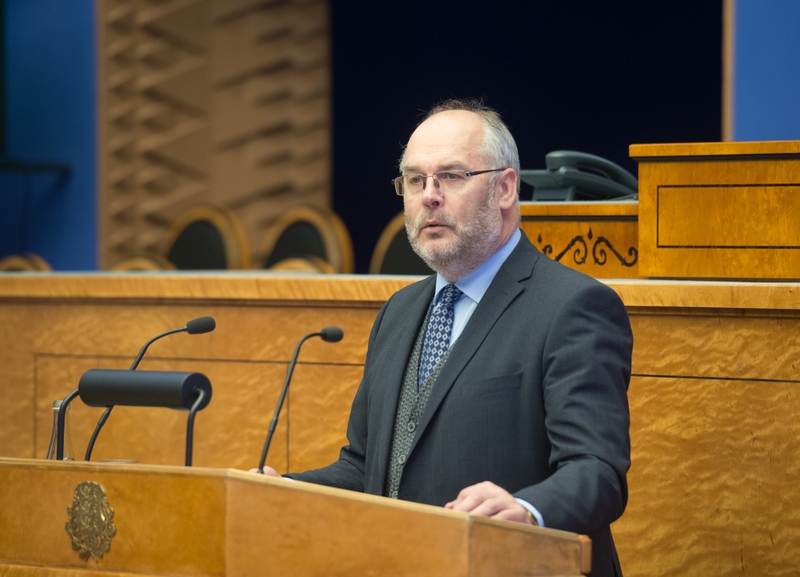 He pointed out that the decisions of the Riigikogu and the Government, the way in which they are made, and the quality of the decisions, are increasingly more decisive for whether the assets are used in the best way to support the sustainable development of Estonia. The Auditor General said that this year’s overview summarised a whole number of problems the resolution of which would not require reforms or over-straining efforts. He pointed out that at the same time there are issues which somehow require a great effort to be resolved. “I have in mind the issues of the establishment, maintenance and supervision of state companies as well as state foundations that have remained unresolved for years. In recent times there are positive signs that the executive power is trying to meet the recommendation of the National Audit Office to become clear on why the state owns one or another company, to set objectives for them, and to partially or fully sell into private hands the companies that the state does not directly need for the performance of its functions,” Karis added. In his report, Karis confirmed that the accounting and reporting of the Estonian state continue to be at a good level. The Auditor General noted that horizontal issues, such as the real estate policy of the state, constitute a separate category. In addition, he pointed out three generalisations on his part from the observations of the National Audit Office, to give the Government to take away. The Draft Resolution of the Riigikogu “Approval of the Consolidated Report of 2015 of the State” (298 OE), submitted by the Government. The consolidated annual report of the state consists of the management report, the annual accounts, and additional information concerning local governments and public sector and government sector. The Bill on Amendments to the Law of Obligations Act and Amendments to Other Associated Acts (321 SE), initiated by the Government. The Law of Obligations Act will be amended by adding provisions that will ensure availability of basic payment services linked to the payment account to consumers. This includes, for example, opening a payment account, placing funds in a payment account, withdrawing cash, initiating direct debits, credit transfers and payment card transactions, etc. Credit institutions may only charge reasonable fees for basic payment services. The Bill on Amendments to the Atmospheric Air Protection Act (319 SE), initiated by the Environment Committee. The Environment Committee initiated the Bill on amendments to the Atmospheric Air Protection Act due to urgent need to amend the procedure for using the auction revenue from emission allowances trading and to amend the Act by adding a provision stating that a decision to reclaim assistance given under the trading schemes created to mitigate climate change is enforcement instrument. The Bill will specify the procedure for using the funds received on an auction. It will add a provision according to which the user of the funds may enter into a contract under public law to use the funds from emission allowances trading. The Bill will also add a provision according to which the decision to reclaim assistance made upon revocation of a decision to satisfy an application for support given from the funds received under different trading systems pursuant to the Atmospheric Air Protection Act and the Ambient Air Protection Act will be deemed to be enforcement instrument within the meaning of the Code of Enforcement Procedure. The Bill will specify the procedure for the use of auction revenue because the Atmospheric Air Protection Act due to come into force as of 1 January 2017 does not allow for implementation of all measures provided for in the state budget strategy at the moment and thereby the use of auction revenue. The proposed specification and the possibility to conclude contracts under public law will ensure the use of auction revenue. 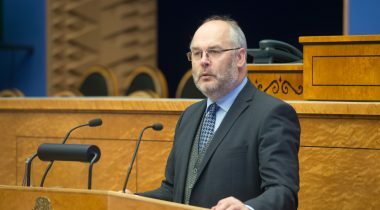 The Riigikogu did not support the Draft Resolution of the Riigikogu “Making a Proposal to the Government of the Republic” (285 OE), submitted by the Centre Party Faction. It was intended to make a proposal to the Government to pay transitional aid to agricultural producers from the state budget to the maximum limit allowed by the relevant Regulation of the European Parliament and of the Council in 2017–2020. During the debate, Martin Repinski from the Centre Party Faction and Kristjan Kõljalg from the Reform Party Faction took the floor. 42 members of the Riigikogu voted in favour of the draft Resolution, and there were four abstentions. As a majority vote of the members of the Riigikogu was needed for the draft Resolution to be passed, the draft Resolution was not supported and was dropped from the proceedings.